The Greek History and Culture Seminars offered by the Greek Community of Melbourne continue with an interesting lecture pertaining to Greece and its membership to the United Nations Security Council, by Sophocles Kitharidis (photo), an international law adviser to the International Affairs Division of the Thai Ministry of Justice and a Legal Policy Officer for the Victorian Government, on Thursday 10 September 2015, at the Greek Centre of Contemporary Culture. Greece’s membership to the United Nations Security Council has had the positive effect of developing the country’s portfolio and bringing it closer to the international political stage, in addition to promoting, inter alia and to the extent possible, the idea that international law is the supreme rule by which the international community should abide by; an idea which resonates throughout Modern Greece’s history since its establishment as a modern state in 1830. Conversely, running and maintaining a seat on the United Nations Security Council has been a rather costly endeavour due to the nature of securing a country’s membership. This lecture will review Greece’s participation in the San Francisco Conference for the creation of the United Nations and will analyse its participation over its previous two terms serving as a Non-Permanent Member on the United Nations Security Council. Looking over the UN Security Council resolutions put forward by Ambassador Alexis Kyrou and Ambassador Adamantios Vassilakis, this lecture will explain the significance of international diplomatic voting, including the issuing of international statements when faced with regional threats to peace and security. In doing so, it will discuss Greece’s involvement within this political landscape critiquing its dedication towards international peace and security, its involvement in United Nations peacekeeping operations as well as what the future may hold if Greece is elected in 2025-2026 as a Non-Permanent Member. 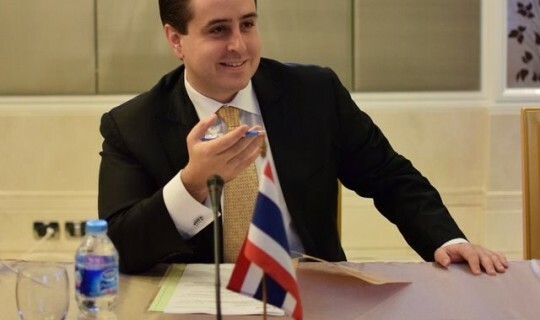 Sophocles Kitharidis is an international law adviser to the International Affairs Division of the Thai Ministry of Justice as well as a Legal Policy Officer for the Victorian Government. Recently completing his Master of Laws in Public International Law at the University of Melbourne, Sophocles’ specialisation has focussed on international law and the use of force, the laws of armed conflict and the laws governing UN peacekeeping operations. From a practical perspective, Sophocles has worked and interned widely within the international arena including postings at the Australian Permanent Mission to the United Nations in New York, as well as on the Security Council when Australia was a Non-Permanent Member between 2013-2014, at the International Affairs Division and Human Rights and Liberties Protection Divisions of the Thai Ministry of Justice in Bangkok, and he was the Australian Representative to the NATO Youth Summit in Brussels, where he presented on the security situation in the Caucasus region. In addition, Sophocles was recently invited to attend the 13th United Nations Congress on Crime Prevention and Criminal Justice in Qatar, as an Individual Expert in Public International Law, where he was briefing the Thai Delegation on a number of issues including human rights, rule of law, the rights of the child and UN peacekeeping operations. He has also worked in the private sector. Sophocles has published in the fields of public and private international law in leading academic journals. In addition, he is on the executive board of the International Law Association (Victoria Branch), and is Secretary of the Australian Hellenic Council, the peak national body representing Greeks-Australians in Australia. The Greek Community of Melbourne and the organising Committee of the Seminars wish to thank the sponsors Dr Marinis & Mrs Maria Pirpiris and Australian Hellenic Council (Vic).